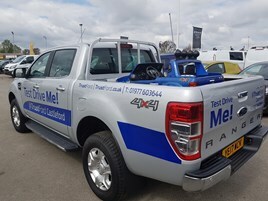 Children’s charities across the UK have had their spirits picked-up after being gifted one of a number of ride-on mini Ford Ranger pick-ups by TrustFord. A total of 14 TrustFord dealerships have selected charities to hand over the toys – worth £280 – to after seeing how much youngsters enjoyed getting behind the wheel at a recent charity event. Transit Centres in Dagenham, Epsom and Birmingham were among those giving youngsters their first taste of life behind the wheel. John Leeman, operations director at TrustFord, said: “We’re delighted to have been able to support charities that are local to our dealerships by donating these Mini Rangers.